Hi all, we are about to embark on another release of new products this week from 3 more designers. That kicks off tomorrow, first, let me share with you a new assortment of Fresco chalk paints. 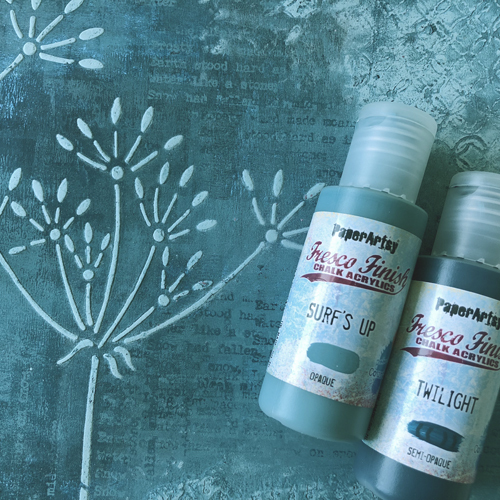 These new paints were created by Miss PaperArtsy, Courtney, and all were designed in pairs: light and dark. However, you will quickly see that all the pairs combine to make many more colourways, and each are fabulous! 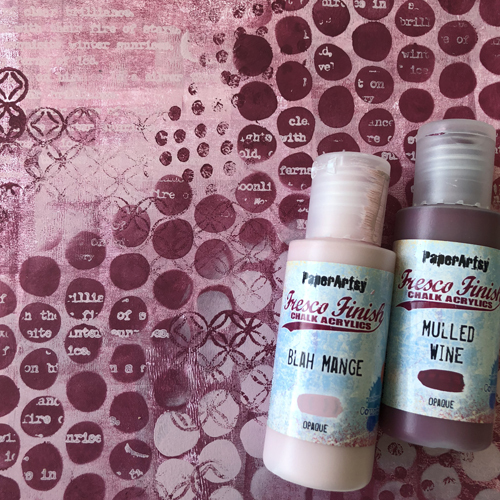 We have been playing with these colours behind the scenes at PaperArtsy for a while now, as have our designers too, and all reports are excellent! Our stockists are ready to go with them in stock, so checkout the list at the foot of this post for more details! 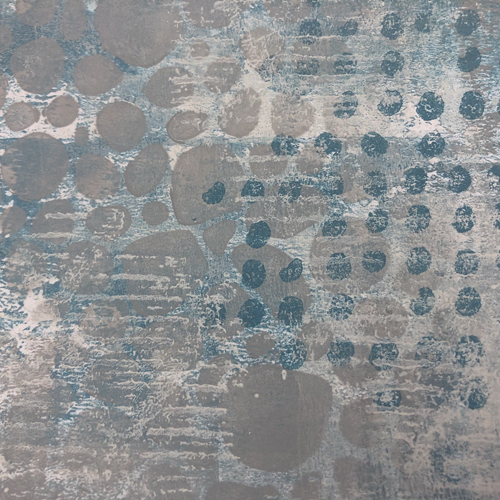 As you can see below, Courtney and I made a series of simple backgrounds using the 2 shades to give you a sense of how they might look together, but of course, there are many more options when you start to create combinations. And wow are there a lot of potential combinations! All our Fresco Paints are a matte effect, fast dry, indoor-outdoor, UV fast, low VOC, environmentally friendly, water based acrylic paint. 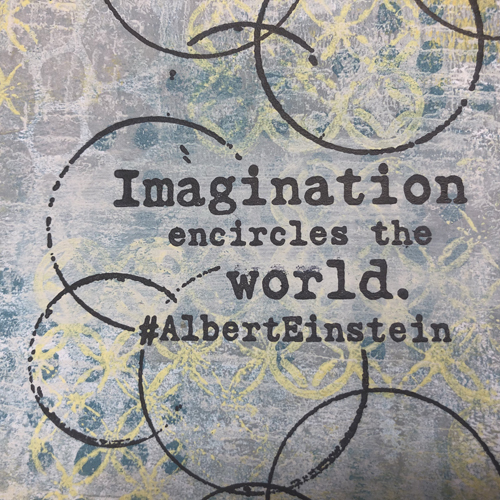 They can be used on all surfaces: not just paper, card, wood and canvas, but also fabric, glass, leather, metal...and even terracotta! 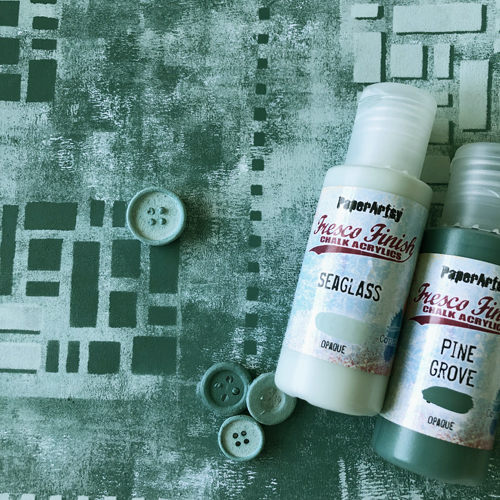 Frescos do not require an undercoat such as gesso - these are a chalk paint, chalk is what gesso is made from, so you now have over 100 shades of gesso! 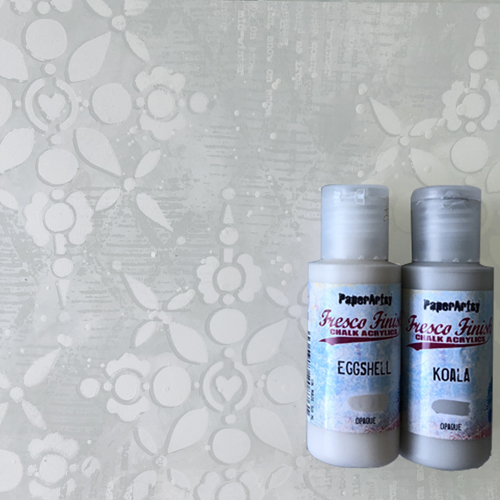 Don't waste your creative time using gesso with these babies! Just crack on! 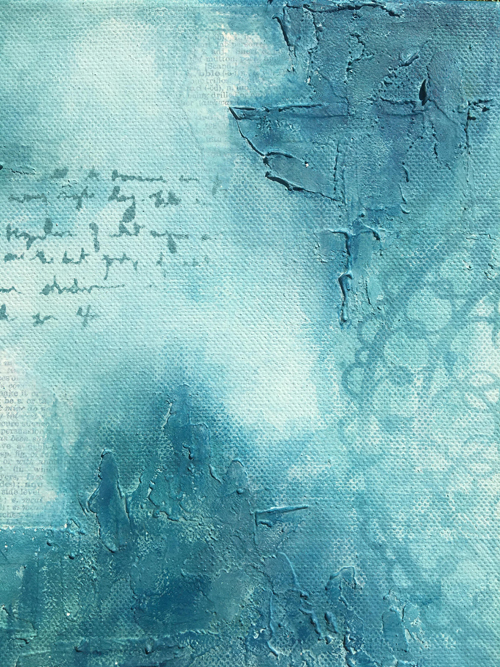 See the blog side bar for many ideas, but also search 'Fresco chalk acrylics' in the blog search and you will find many posts loaded with techniques and suggestions. We love that Fresco paints are mostly very high coverage ie. 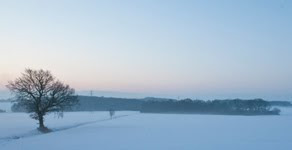 fully opaque (that means only 1 coat required in many instances). 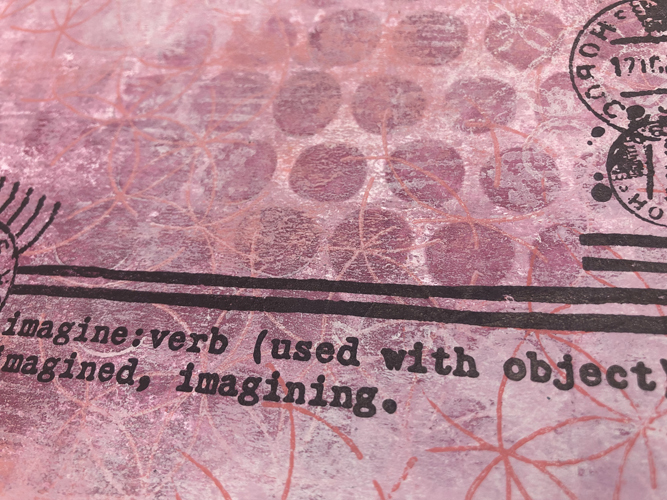 Opaque colours are ideal for underneath layers in your journal pages, they are also ideal for contrast stenciling, and they are really nice to use for tinting gels and mediums as the are high coverage means just a few drops is all that is required. Some of the brighter colours have a lower opacity, and are much more translucent. We love these for adding bright layers to an opaque bases, they are perfect for colouring in, and they are also perfect for colour mixing too. A soft minty blue-green shade, opaque. a mid tone cool grey, opaque. the perfect neutral shade, opaque. the deep blue of a rich tropical night sky, semi-opaque. classic cool mid blue, opaque. A gorgeous deep, rich yellow, translucent. A soft pale lemon, opaque. A peachy salmon shade of summer in a bottle, opaque. 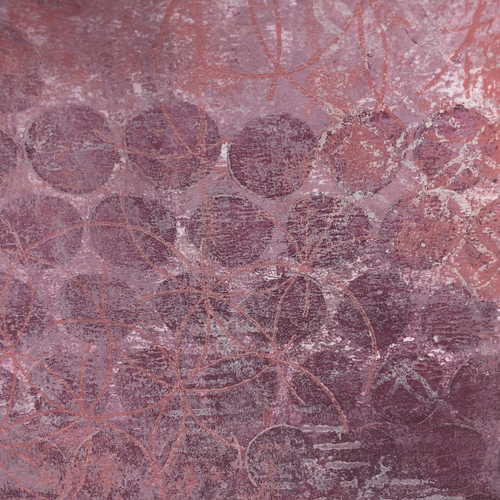 the popular pink toned neutral returns, one of our original frescos, opaque. Intro: Where to start, there are oh-so-many possibilities with 12 paints! 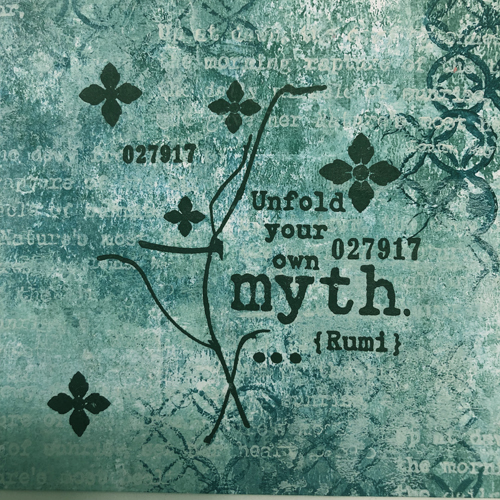 I've made a bunch of quick card fronts...well to be honest, they haven't even made it to card front status yet, but they just need to be matted and layered. 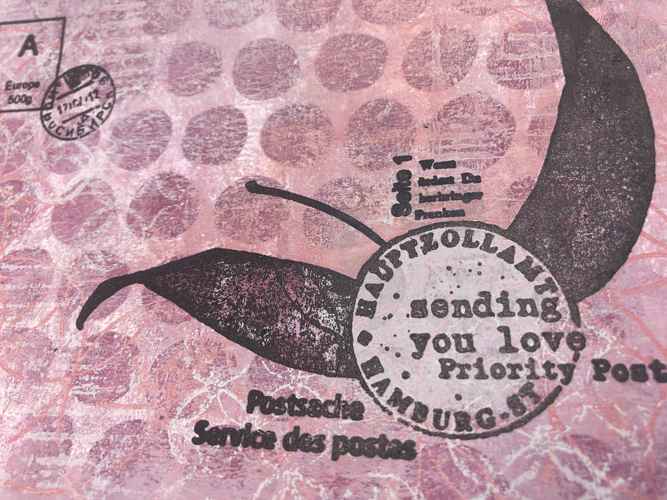 The basic premise was to brayer, stencil or gel-print a masterboard background using 2-4 colours, then overstamp with Sara Naumann's new stamps released last month. This method is so fast, and always produces great results. 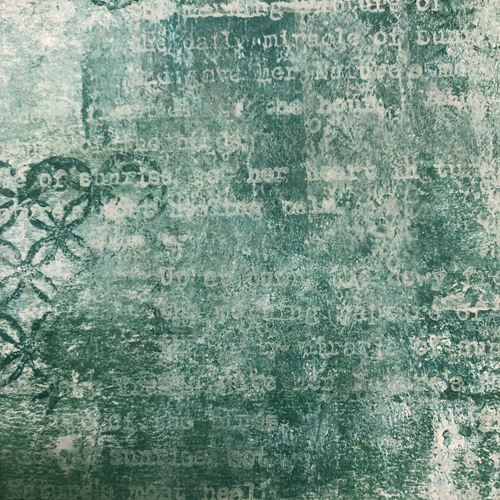 Starting on Heavy Smoothy cardstock, brayering a dark base of both Twilight and Pine Grove, then brayering and stamping with Sea Glass and Chalk to soften. This creates a lovely underwater feel, cool and refreshing. The stamped images are from Sara Naumann sets 26, 27, 28 (released June 2018, see here) with background font from the Alison Bomber series. 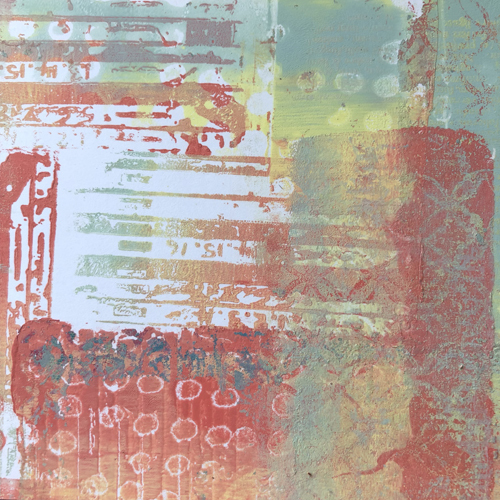 All of this background (which also is a section of an A4 sheet) is a mix of gel printing, stamping, brayering. 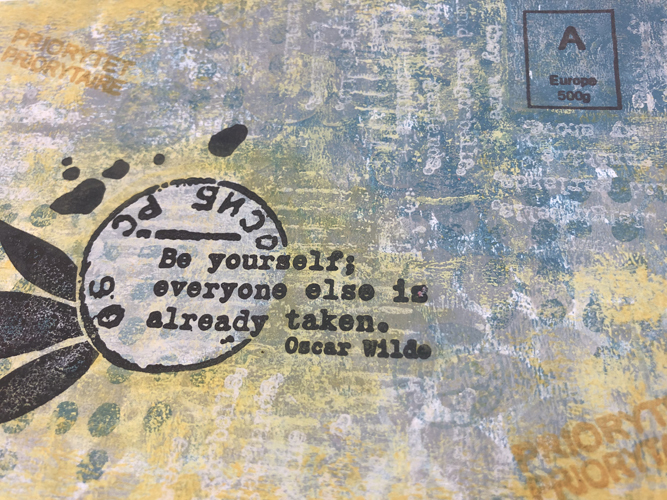 A smooch of Eggshell was rubbed in the spot where the stamping would go to make the quote pop a little. 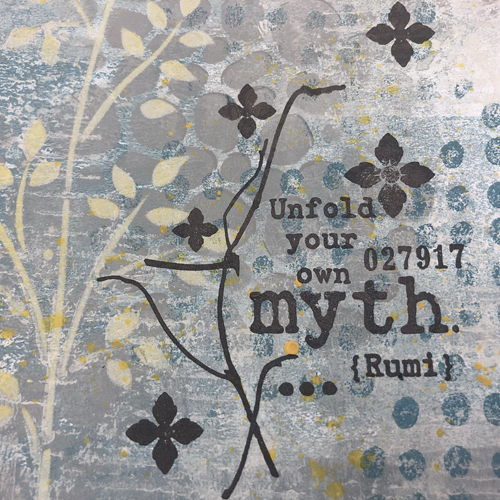 I'm loving the white space whihc are either a natural effect of gel printing, or created by stamping in 'chalk' colour paint, my go-to background softening method. Again, stamps are from Sara's new sets. The first sample I started with brayered Surf's Up, then stencilled with Sara's New stencil (PS102, see here) in the lovely grey Koala. A bit of stamping with some Seth Apter spots and Mesh (ESA02) in Surf's Up and Chalk respectively and I had the basic very cool shade background as above. 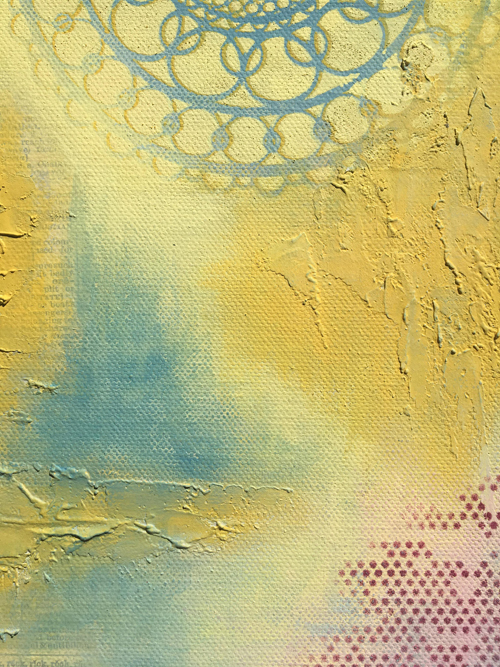 So next I added the Mustard Pickle softly, stencilled in Chalk first through Kay Carley's stencil PS061, and then softly added Mustard Pickle on top, with a few Yellow splats flicked over too. 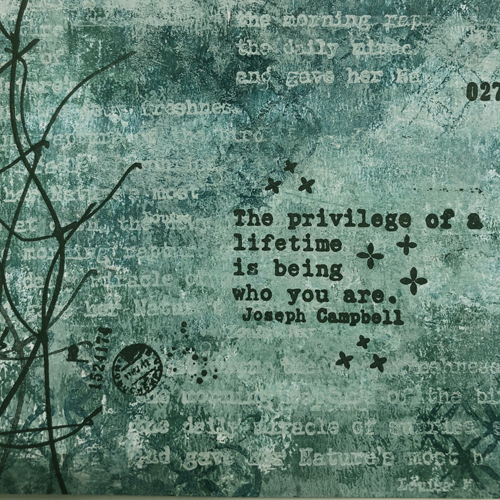 This sample has a little bit more of the Pickle stamped with the stamp I cannot stop using from Seth's Set ESA08. But, when you go full on Mustard Pickle, you get such gorgeous warm tones. 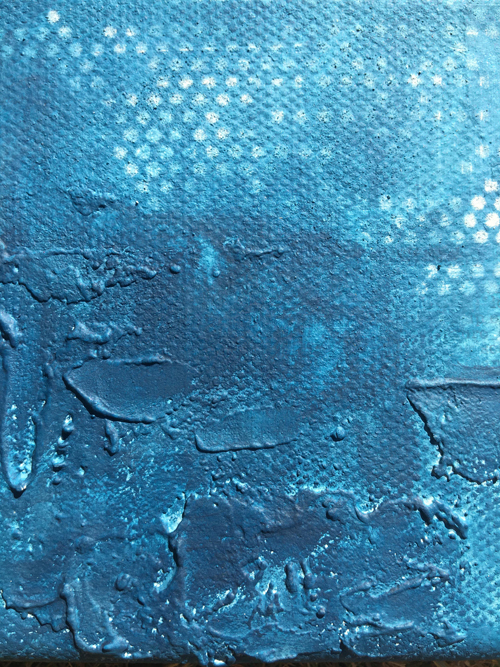 As it is a translucent, It allows the blue to be seen through the yellow, suggesting a hint of green. 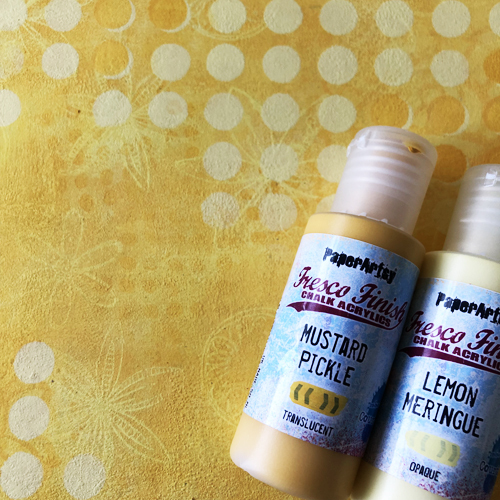 Now if you added Mustard Pickle to any Wet blue paint, then you would create a new colour - sure to be a gorgeous green, but if you layer it onto dry paint, then you predominantly get the lovely rich shade of yellow, the colour we really wanted in a new paint! Ok, so you are getting the idea of how well these paints mix, and I have only been using them in 3's!!! Here's my final play, but my goodness I really, really want to do this with yellows too to add some zing to this colourway! 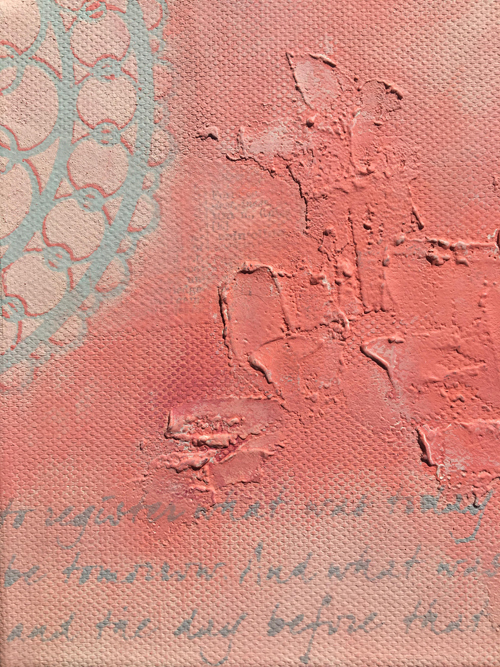 If any of you have taken a make and take with me at Ally Pally, or watched me demo, you will know that I mostly prefer paint and texture to stamping. I've always preferred an abstract style of art, so I decided to make a series of canvases with these colours that could be displayed together in a grouping (or the same concept could be applied onto one large canvas too i guess). But it was a nice way to explore the new paints, how they blend and layer, and the depth of tone. 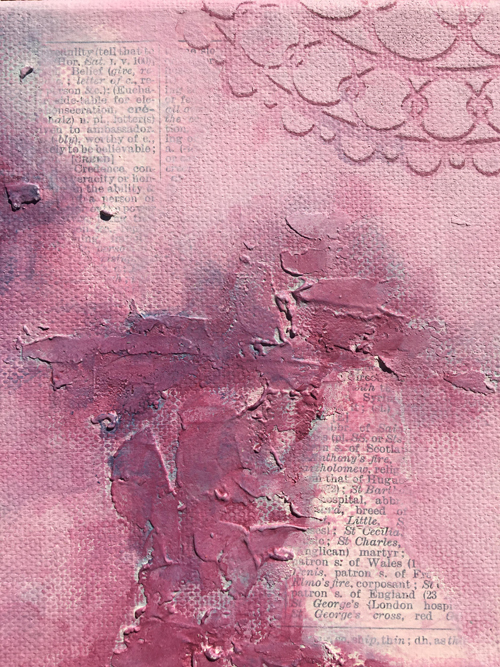 On each canvas I started with positioning bits of ripped paper to establish a sort of structure, plus I also hate starting with a blank canvas, so this is my way of breaking that beginning "ahhh I don't know what to do" phase. 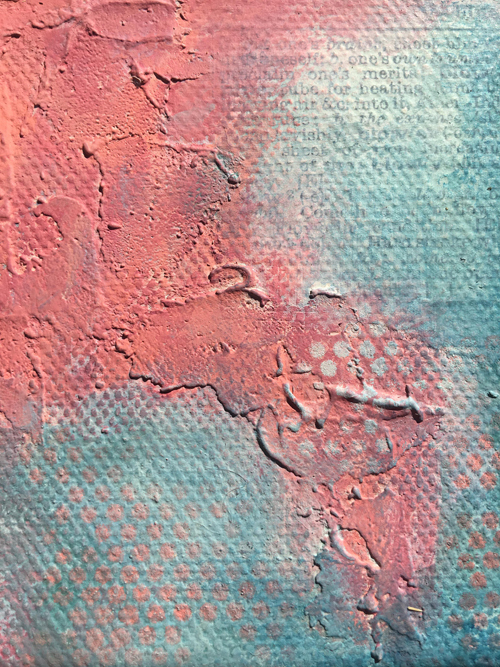 I then added grunge paste with a palette knife to create my textured areas. I tend to use the textured areas as my focal points and I like to build up these places with layers of colour and to add depth. These paints all blend in together really well and as a lot of them are opaques they are easily buildable, when coming up with the ideas for colours that I felt were missing from the already vast paint collection. A blue that was deep and dark, but that would also be a good accent colour for touching up and highlighting the tips of texture areas. I specifically wanted Twilight to be translucent so that the colours underneath would complement the dark on top. 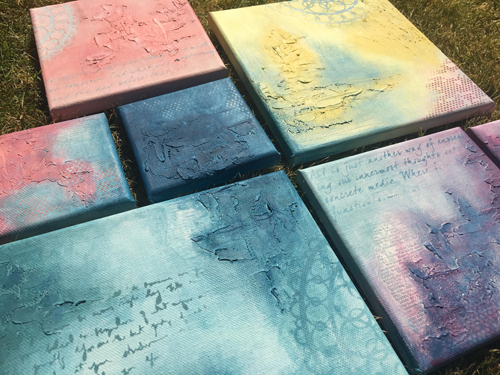 I decided to stick with just three or four stencils to bring the canvases together, as I know that i would be differentiating each canvas by colour so I really wanted to keep them connected using another method. 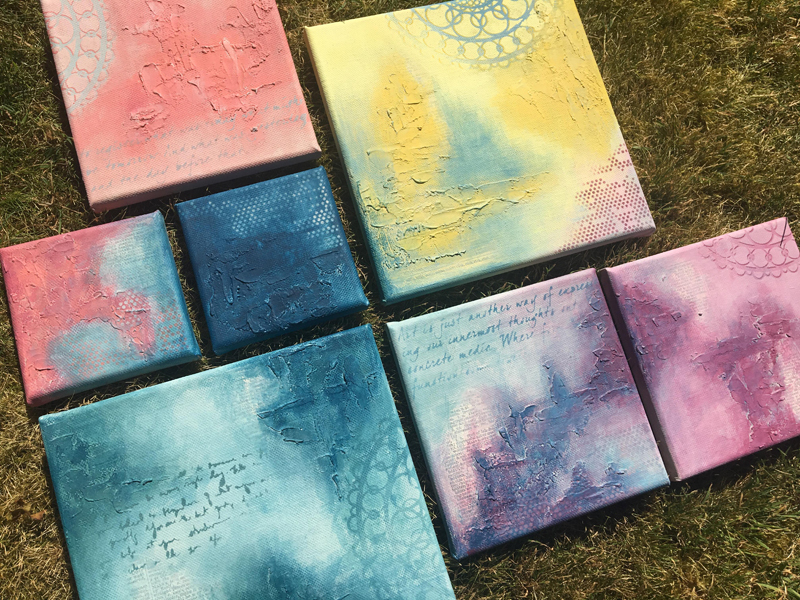 I've never actually used stenciling in previous canvases that I have made and I now think that my other canvases are missing something! Always learning new things right?! Pinks and yellows are not my fave's to work with, but somehow when I was making the paint colours these appeared in my colour selections so I obviously had to try to work with them... I must admit I really struggled until I added blue to the canvases. Often a striking contrast is so important to make everything come together. 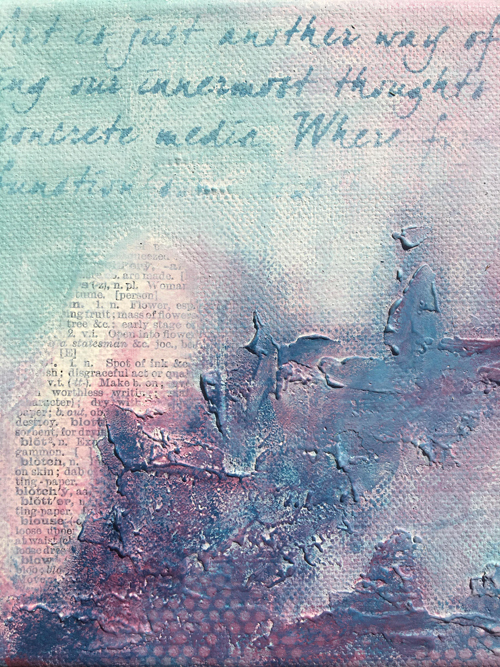 It seems that I might have neglected the colours eggshell and koala, but after every canvas was made, prepped with paper and grunge paste, I base-painted over them with eggshell and then painted the textured areas with koala so i knew these areas would be my dark building areas. I haven't done any painting probably since Version Scrap and it was a lot of fun to be able to have a play around with colours that are so flexible together! Plus I was 'kitten-sitting' this weekend and needed something to pass the time between feeding and cleaning the litter tray!! Hope you enjoy these paints! I think you will ... a lot! 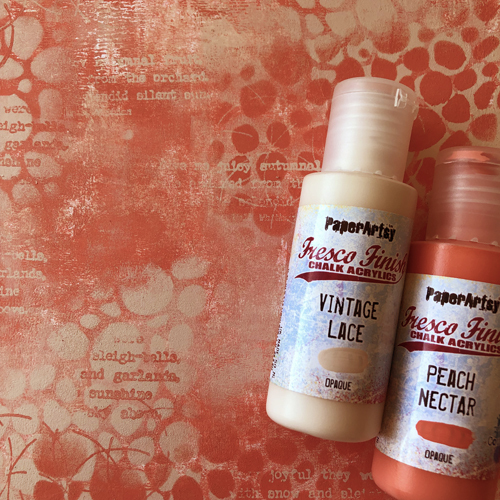 Leandra says: I know how much you love your Frescos, and we are fully stocked as are our retailers, so all these are available now. See the links below to find a stockist near you or perhaps an online supplier. 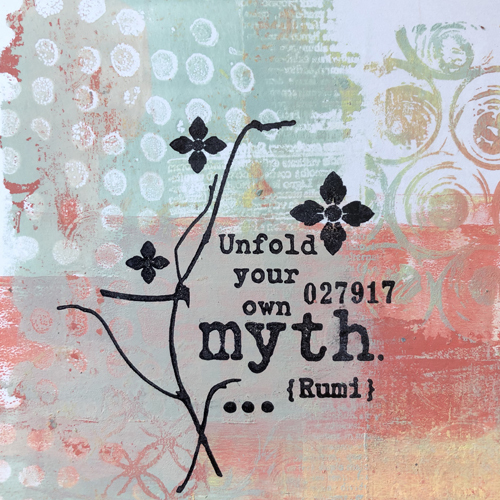 Please remember you can now join our new Facebook group PaperArtsy People, many of our stockists and designers are also members, so they are there to handle your questions and provide class information too. Congratulations Courtney on creating these beauties!!! Going to e hard to step away from them!!! What fabulous colours and samples, Courtney! I never use anything except Frescos and these will really fill some gaps I was feeling. Definitely felt i needed the yellow and the peach but I know i will get them all! Hope this is the beginning of a big Courtney line! Congratulations Courtney.... I love them...I've been using them for the last week or so....I adore them! Congratulations Courtney, these are going to be a big hit. 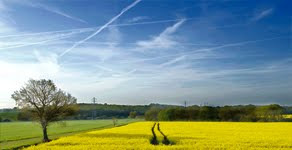 I love the canvasses, beautiful colours and textures! Love, love, love the new colours, and all the gorgeous samples. Yes please to a FB live on the brayer mini gel plate thing Leandra! Beautiful combinations, love all of the colours! Fabulous colours and samples! Love them all - even the brights!!! Well done Courtney! Beautiful paint colours and samples too! Congratulations Courtney!! Love the new paints, also the canvases and the colour combinations you've made. I'm going to try some of those, they look beautiful!! 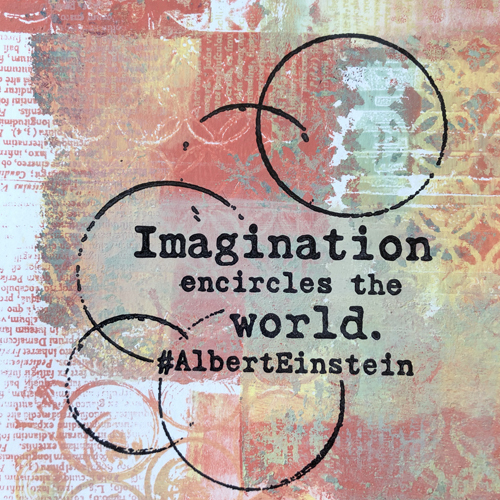 Great tip by starting with some mini collage and GP to break the blank page. And yes, Leandra, we want a FB live of you doing backgrounds! I'm sure I'm not alone when I say we could watch you all day doing masterboards! All the samples in the post are fabulous!! Congrats ladies!! Fabulous colors, Courtney - congratulations! I can't wait to play with these. colours colours I'm not an American! !